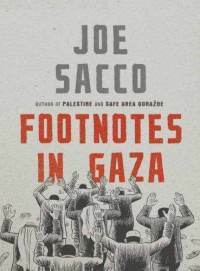 Footnotes in Gaza by Joe Sacco. Metropolitan Books, 2009. Hardcover. 432 pages. Footnotes in Gaza has been on my radar for a while, but because of its size and the complexity of the content, I was always a bit intimidated by it. I finally picked up this hefty graphic novel because it was one of the options listed to read for a class I was taking this past winter quarter, because there's nothing like a school requirement to motivate you to do something, right? Footnotes in Gaza is journalist Joe Sacco's exploration into two sparsely covered reports of massacres that occurred in Khan Younis and Rafah, both located in the Gaza Strip, during the 1956 Suez Canal Crisis. The facts of these events, what really happened, and who is at fault is still debated, but Sacco's aim was to find out -- from firsthand accounts and interviews -- what happened during these massacres. This is a dense graphic novel. There is so much information packed into these pages that it took me an extremely long time to get through the entire thing. I found myself needing to stop a re-read a few pages to fully grasp what was going on before continuing on with the story. If you, like me, are unfamiliar with much of the content and the background of Israel-Palestine conflicts, then it takes a little time to fully understand the things which Sacco describes, but fortunately he does provide enough background information to make everything come together. In addition to the obvious topic of the Khan Younis and Rafah massacres, this novel covers so much more than just those two events. Sacco takes his readers with him as he travels around the Gaza Strip in the present day (then 2003) to see the current conditions of those living in Palestinian land, and he also receives firsthand accounts about other periods of time in Israel and Palestine's tumultuous history. This is an extremely compelling read, and there are no details left out. It is extremely heartbreaking and frustrating at times to read of the horrific violence and deplorable conditions those living both then and now experience. The illustrations are all done in black and white, but that does not in any way take away from their impact and meaning. He illustrates every story he is told, no matter how dramatic or devastating it is, which allows each person to have a face and a story to tell. What I found particularly interesting about Sacco's journalism was that so many of the people he interviewed were perplexed by his interest in these two massacres -- why did he care about things that happened so long ago, when so many other thing had happened and were currently happening? To me, this brings up an important discussion about why events in history are important, even if they are just considered "footnotes." Some people seem to claim the Sacco is too biased towards the Palestinians, but I do not personally feel that is the case. I saw Sacco as a mainly looking to find information on one particular event in one place, and that is exactly what he did. He told the accounts as he was told them, and he mentions many times that not all of these stories may be accurate. Overall, I am giving Footnotes in Gaza four stars! I really enjoyed this graphic novel, but for me it was quite difficult to get through at times. Despite this, I still think it is an extremely important book about some rather unknown events that should be considered.